Video — The Demon Primate — National Geographic. So I wrote a post on this primate back in October, but it’s one of my favorite mammals so sharing this video was a must. The aye-aye is way too awkwardly cute to be ignored. And who doesn’t love Madagascar? 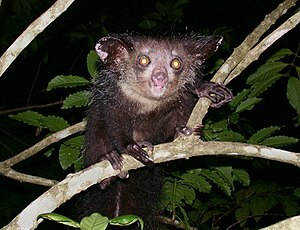 The Aye-aye of Madagascar is one of my favorite nonsensical animals. It just looks crazy. Whether or not you can tell by looking, at this odd, mousey, little thing, the aye-aye is a primate. Yes, people, we are related to this animal. They have super skinny fingers, and use the longest (the middle finger) to tap on trees and locate prey to eat. Once they bite their way into the tree, they use their long, clawed finger to fish out the insect. They are nocturnal, so their ears and eyes are large to help them survive. They are believed to be the only primate to use echolocation. Madagascar natives believe that the aye-aye is an omen of bad luck, so the creatures may be killed on sight. Due to this and habitat destruction, aye-ayes are near threatened and now protected by law.